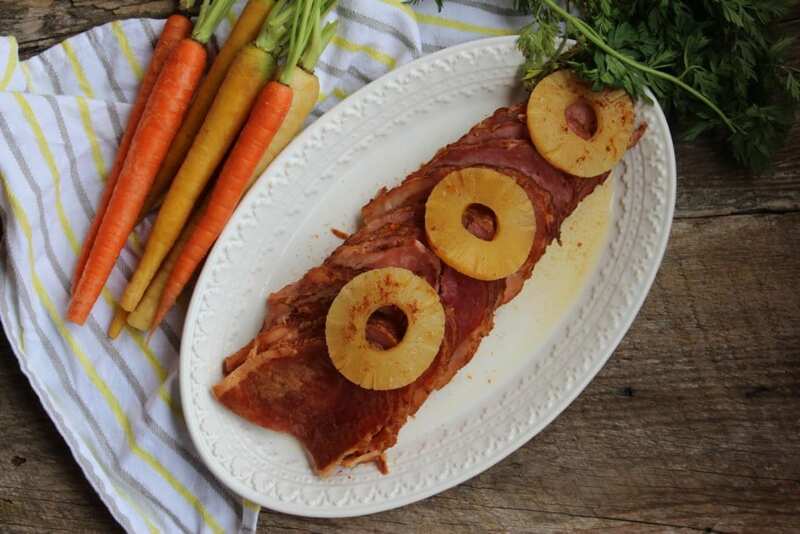 I don’t know about you, but we always have a ham on the table for Easter Dinner around our house and this Slow Cooker Pineapple Ham is no exception. All of the wonderful flavors of spring and the approaching summer are wrapped up in this juicy, tender, Slow Cooker Pineapple Ham. 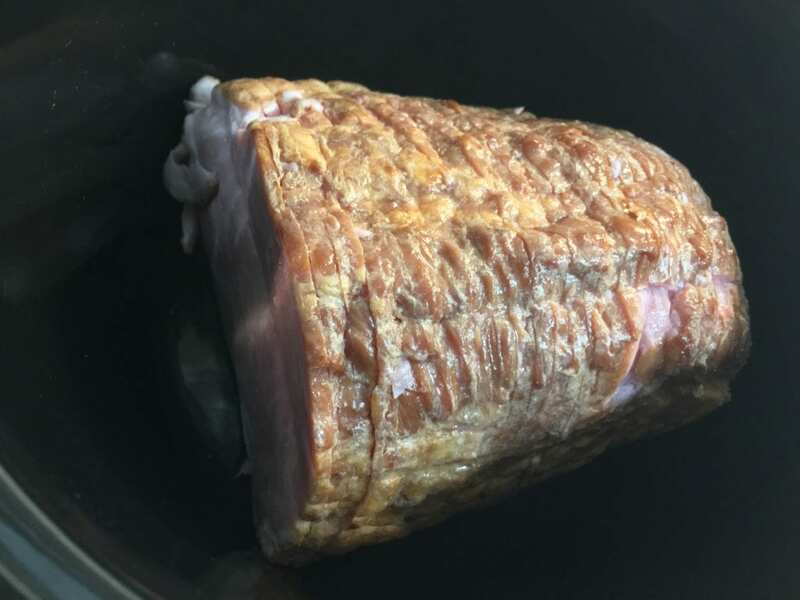 The best part about this Slow Cooker Ham recipe is that it all cooks effortlessly and completely hands off in your slow cooker which is perfect for freeing up the oven for Easter dinner! 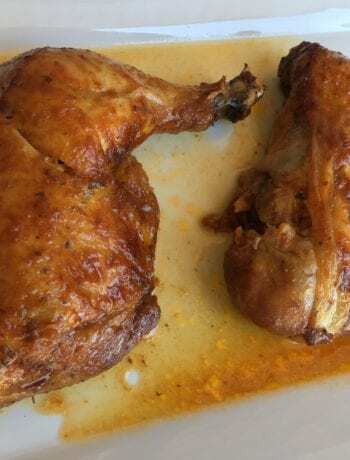 You guys know by now that the name of my cooking game here at The Speedy Spatula is fast and easy recipes. 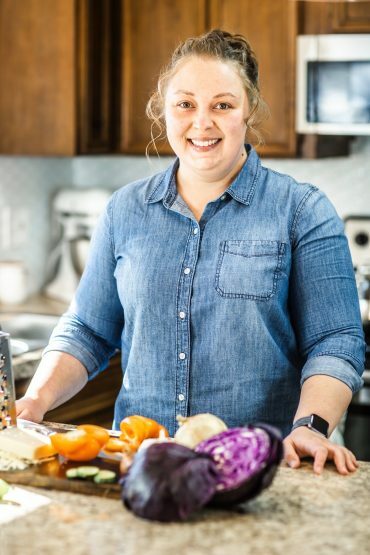 I’m a wife and mother so I don’t have a lot of time to spend in the kitchen slaving away over a stove. 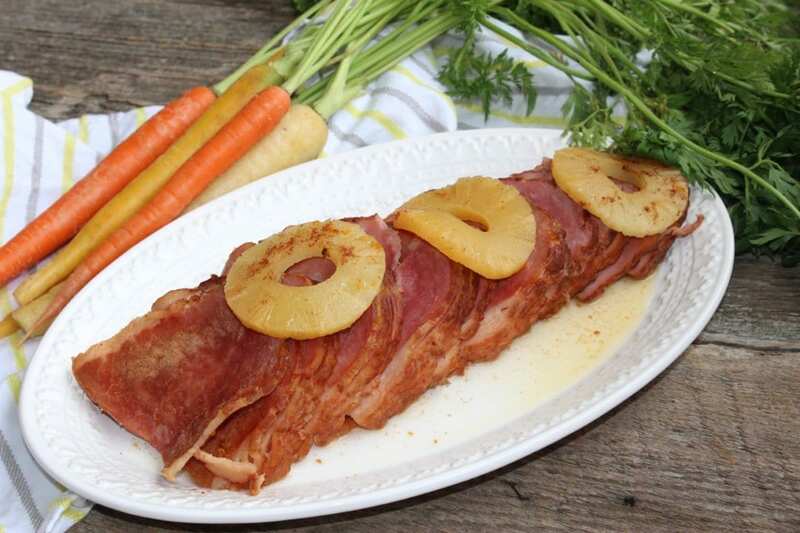 This Slow Cooker Pineapple Ham recipe is no exception to that rule! 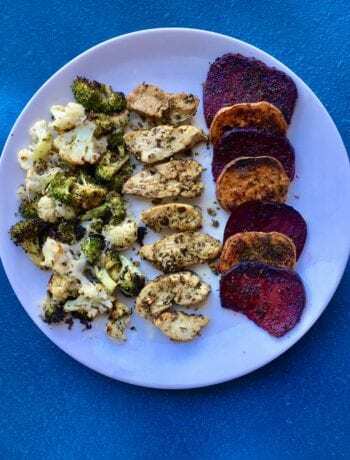 With only four ingredients, this recipe is both easy and delicious. Without further delay, let’s just go ahead and jump straight into making this Slow Cooker Pineapple Ham, shall we? I started out with this beautiful, pre-sliced, boneless, smoked ham. 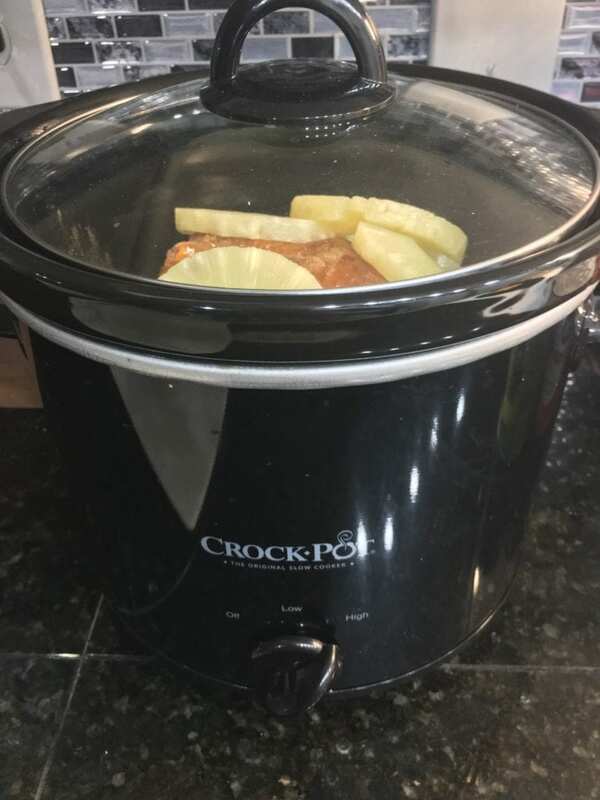 Any type of ham could be used for this Slow Cooker Pineapple Ham recipe though. 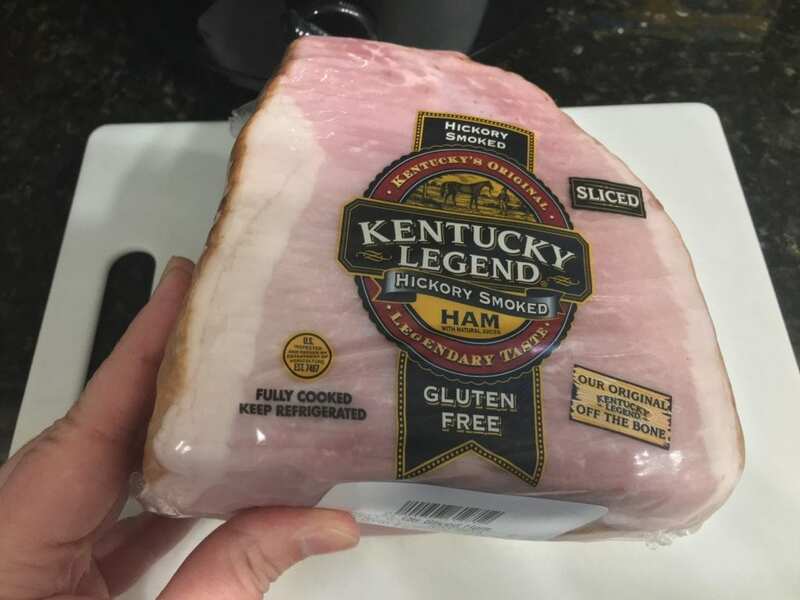 My ham was only three pounds but if you’re cooking for a large group you can always buy a larger ham and just double the ingredients for this recipe. 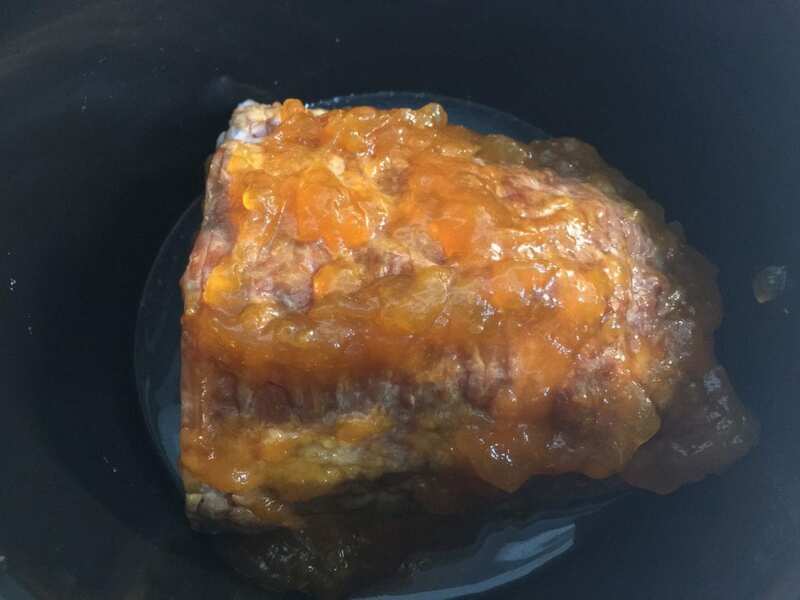 Remove the ham from the packaging and place in a four quart or larger slow cooker. 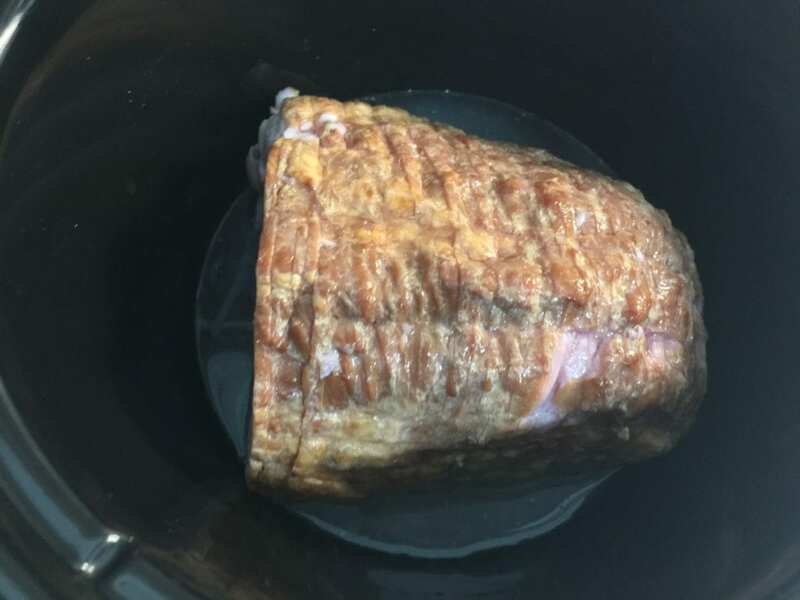 My ham just fit in my four quart Crockpot Slow Cooker but if my ham would’ve been any larger, I would’ve needed to break out my five quart Crockpot. Break out the sliced pineapple and pop the top off of the can. 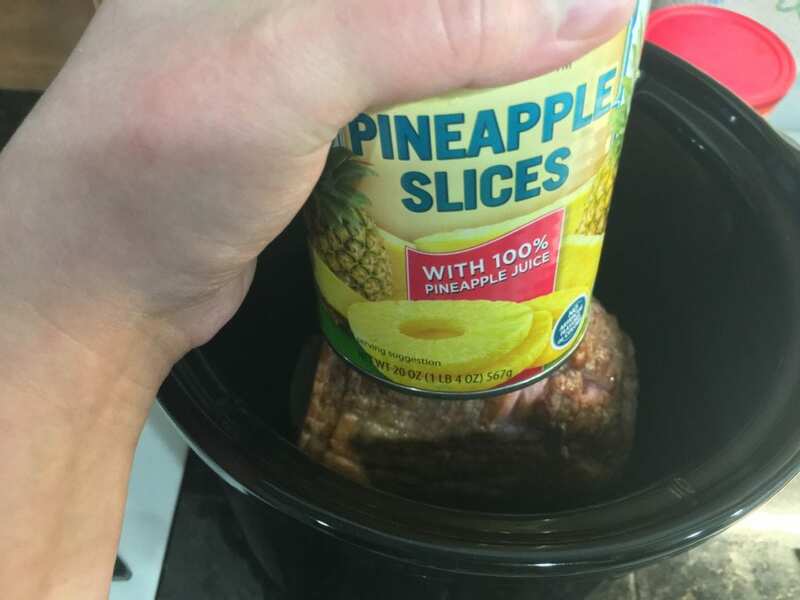 Pour the entire twenty ounces of pineapple juice over the ham in the slow cooker. Once the pineapple juice has been poured over the ham, use a spoon to spread Apricot preserves over the top of the smoked ham. 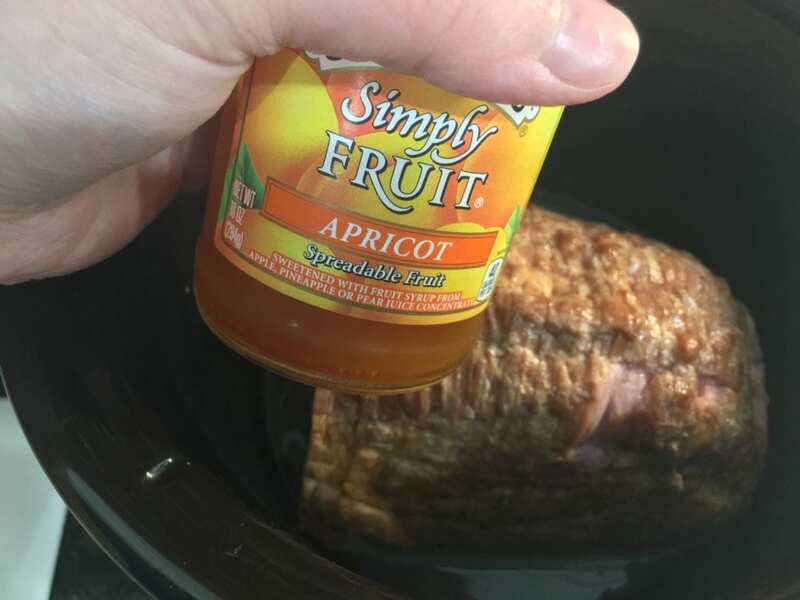 Adding the Apricot Preserves or spreadable fruit like I used will give your Slow Cooker Pineapple Ham a nice, fruity glaze. Now I like to get a little fancy with it and lightly sprinkle the top of the ham and apricot preserves with ground cinnamon. I don’t measure the amount, just lightly and evenly sprinkle with cinnamon. This gives the ham a nice, warm and comforting flavor. If you were wondering what to do with the sliced pineapple, wonder no more! 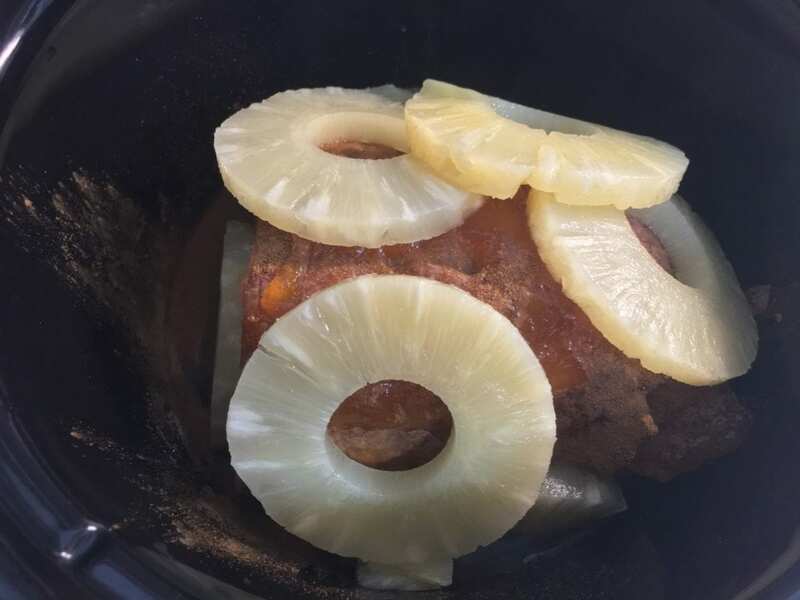 I places several slices of the pineapple rings on top of the Slow Cooker Pineapple Ham and around it on the sides. 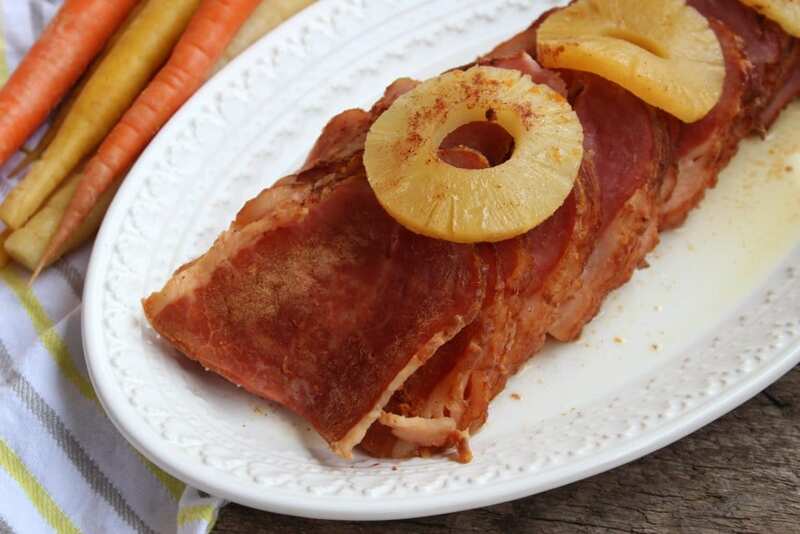 Now you’re ready to cook this Slow Cooker Pineapple Ham! 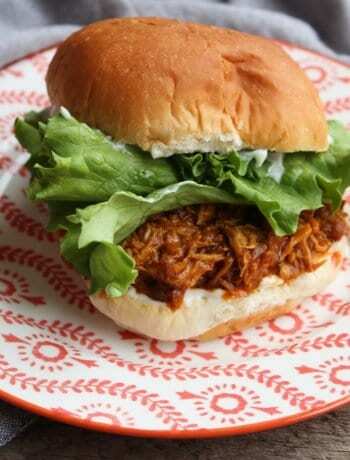 Place the lid on the slow cooker and cook on high three hours or low five hours. Once the cooking time is complete, carefully remove the ham from the slow cooker using two large serving forks on each end of the ham and place the Slow Cooker Pineapple Ham on a pretty serving platter. 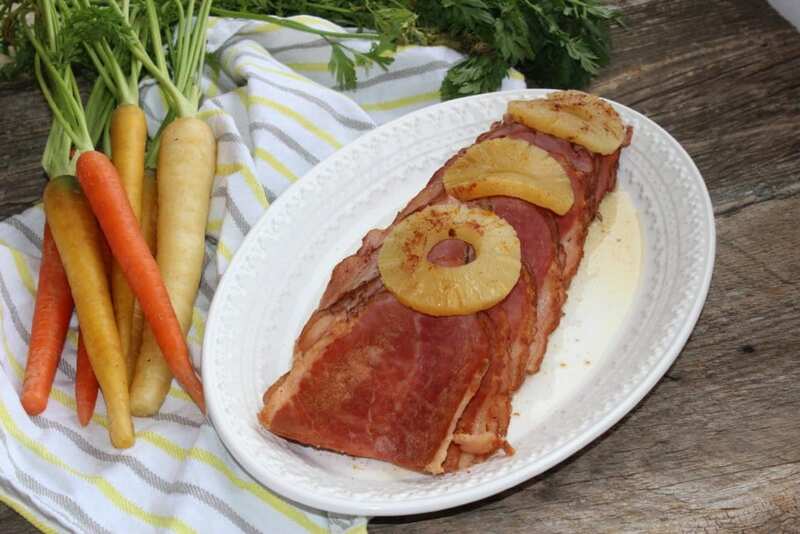 Anybody ready to dig in and enjoy this Slow Cooker Pineapple Ham for Easter dinner? I know I am! Delicious, tender, and juicy ham perfect for Easter dinner! 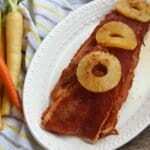 Place the ham in a 4 qt or larger slow cooker and pour the pineapple juice over the ham. Use a spoon so spread the apricot preserves over the top of the ham, then sprinkle with cinnamon. Place about 6-8 pineapple rings over the top of the ham and around it on the sides. 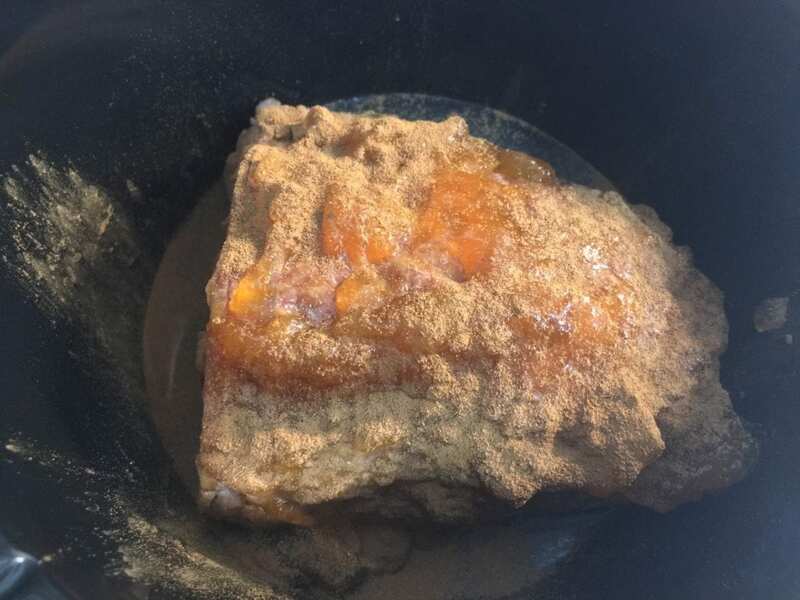 Place the lid on the slow cooker and cook on high 3 hours or low 5 hours. Once cooked, remove the ham from the slow cooker using two serving forks stuck into each end of the ham. Place on a serving platter and serve. One 3lb ham should serve 4 people at about 5 slices for each person.